Ziv, Guy. Why Hawks Become Doves: Shimon Peres and Foreign Policy Change in Israel. Albany: State University of New York Press, 2014. Why do hawkish leaders change course to pursue dovish policies? In Why Hawks Become Doves, Guy Ziv argues that conventional international relations theory is inadequate for explaining these momentous foreign policy shifts, because it underestimates the importance of leaders and their personalities. Applying insights from cognitive psychology, Ziv argues that decision-makers’ cognitive structure—specifically, their levels of cognitive openness and complexity—is a critical causal variable in determining their propensity to revise their beliefs and pursue new policies. To illustrate his point, he examines Israeli statesman Shimon Peres. Beginning his political career as a tough-minded security hawk, Peres emerged as one of the Middle East’s foremost champions of Israeli-Palestinian peacemaking. 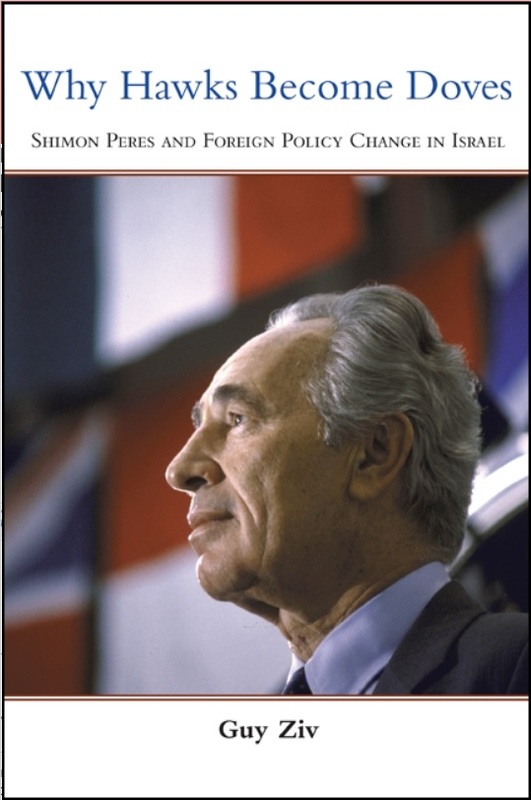 Drawing on a vast range of sources, including interviews with Peres and dozens of other political elites, archival research, biographies, and memoirs, Ziv finds that Peres’s highly open and complex cognitive structure facilitated a quicker and more profound dovish shift on the Israeli-Palestinian conflict than his less cognitively open and complex rivals.